It is becoming increasingly apparent that Randy Quaid, who has frequently played oddball characters like "Cousin Eddie" in the "National Lampoon's Vacation" films and the not-entirely-sane pilot in "Independence Day," has not been acting. Quaid and his wife were arrested in Canada last week on a warrant issued after they failed to appear at a court hearing in Santa Barbara. The Quaids were to face felony vandalism charges based on an incident in which they were discovered squatting in the guest house of a home they once owned. By "squatting," I mean they were living there without permission, not that they were physically squatting, but given the Quaids' ever-increasing weirdness they might have been squatting in that sense too. The Quaids were arrested in Vancouver, and told an immigration judge there last Friday that they wanted to seek asylum in Canada because they feared that their lives were in danger. Not from the authorities in Santa Barbara, but from the Star Whackers. 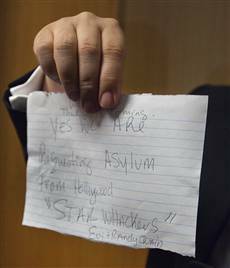 requesting asylum from Hollywood "Star Whackers." Although "the Star Whackers" would not have been a bad name for the aliens in "Independence Day," and is also not a bad name for a band, the Quaids appear to be using the term to refer to a shadowy organization they say has killed a number of their Hollywood friends, including Heath Ledger, David Carradine, and as many as six others. (As far as I know they have not suggested a motive for the killings.) Most authorities believe the Ledger and Carradine cases did not involve foul play, although that's exactly what you would expect them to say if they were in cahoots with the Star Whackers, isn't it? The Quaids also told the judge that they came to Canada for legitimate reasons and were not trying to dodge the warrant, although coincidentally they did say they feel the U.S. justice system has treated them unfairly. Warrant-dodging would be consistent with their conduct in a previous case in which they were charged with "defrauding an innkeeper" and frequently failed to show up for hearings, but they insisted that was not their motive here. The report doesn't say what the Quaids claimed were their "legitimate reasons" for being in Canada, if it was anything other than seeking asylum. Nor does it say whether they explained why the Star Whackers secret assassination squad, skilled enough to murder eight famous people without leaving a trace, could be foiled just by moving to Canada. After asking for asylum, the Quaids were released on bonds of just $10,000 each, although they are clearly flight risks. But they promised the judge they would appear at future hearings if he let them go. "I would not do anything to besmirch my reputation any further than it has been," Randy Quaid said. "I'm trying to do damage control." They have another hearing set for October 28 — if they survive that long.